Durr VSA300 intake filter, where it is and why you should care. Home » Blog » Durr VSA300 intake filter, where it is and why you should care. and why you should do it! For the sake of speed you can watch one or all of our short videos about these topics here. The Durr VSA300 dental vacuum unit is one of the most common units used in dental surgeries. They are quiet, powerful and fantastic value for money, they are easy to tuck away out of site and they can tolerate a long run of pipe between it and the suction manifold or handpieces without a significant loss of power. They are easy to service (we can strip one down and put it back together in an hour) and they rarely break down unless you do not clean them. Many (in fact an awful lot) of dentists, nurses and practice managers do not know that there is an easily reachable filter in the front of the unit that needs checking every couple of weeks or so. Looking at the front of the unit you can see two pipes coming from the unit, one of them is an intake and one of them is an outlet. 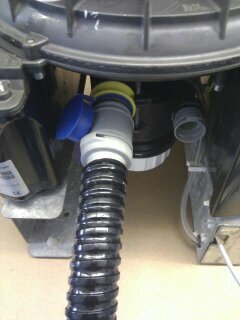 The intake (from the chair end) has a yellow piece stuck into the front of the unit, this is a push fit connection. Before you pull it out lift one of the suction handpieces and start the unit allowing it to run for approximately 30 seconds to clear any water that may be sat inside the pipe.. then simply pull it out from the unit. Now you can pull the yellow filter from the pipe end enabling inspection. This should also be a simple push fit. Note well that a 25% blockage here will result in 25% less suction.. . we have actually seen them completely blocked therefore the suction was non existent, this cost the practice manager over £100 in callout and travel costs (not us I might add!) 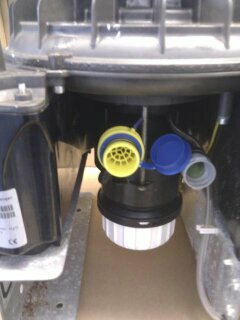 Simply give the filter a tap into a sink and bit of a rinse and you should be good to go. Now push everything back together as it was making sure that the pointy bit of the filter is going towards the unit and not the pipe.. it does not really matter but get it right if you can. Watch the video .